I wouldn’t dream of missing an episode of Project Runway, and I am full of admiration for Tim Gunn. He has such innate dignity and kindness. Now that I have read about the darkness of his own youth and how he was able to overcome his demons, I have even more respect for him. 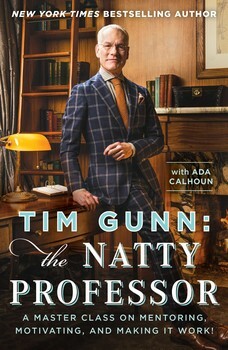 In Gunn’s latest book he talks about his teaching philosophy. On, there is a bit of celebrity gossip thrown in, but he mainly describes what makes a good teacher or mentor. This is valuable information for those in education and in business too. Gunn is a self-proclaimed lover of acronyms and presents his basics as T.E.A.C.H. The T stands for truth telling. Viewers of Project Runway know that Gunn will tell designers if he doesn’t understand or doesn’t like what they are doing. He’ll say it gently, but he will say it. E is for empathy. It is impossible to teach someone if you don’t know where they are from and can’t recognize their strengths. A is for asking. Gunn is a firm believer in the power of questions. He does this not only with his students and mentees but also in everyday life. Seeking more information is second nature to him. The C stands for cheerleading. Great teachers help the students grow by encouraging them and building their confidence. Finally, the H is hoping for the best. Sometimes a teacher just has to let go and let the students sink or swim on their own. Interspersed with Gunn’s thoughts are many paragraphs by others telling about the best teacher they ever had and why that teacher was so special. When American students continue to lag behind those in many other countries, the need for better teachers is apparent. When the majority of employees are disengaged from their jobs, the need for better mentors is also apparent. Gunn’s insights could go a long way in improving these statistics.